Hi from NYC! As I write this I am currently at JFK waiting to board my flight home. It’s been a whirlwind of a weekend, busy working an event for my job and running all over NYC trying to cram as much exploring in as possible in between work things. It was a nonstop weekend but so rewarding and fun. I was constantly reminded of our life in New York and it felt like we never left! We took the subway all over town, walked through Central Park, and hit up as many of our favorite spots as possible (Chelsea market, Rockefeller center, Eataly, Union Square). We even met up with some old friends (hi Alex and Joel!) and made new ones (hi Kristie!) who we showed around the city. For only being there for not even 3 full days, I managed to somehow consume bagels, donuts, pizza, pasta, ramen, several salads (yeah I definitely needed some greens), cereal milk ice cream, and cookies!!! Everything was amazing and while we did walk a lot, I think I need to get back in my workout routine stat so I don’t end up in a food coma before Christmas. Speaking of cookies, the event I was working this weekend included a giant cookie swap!! I got to try all of the amazing cookies (including @sarah_kieffer’s famous pan banging chocolate chip cookies!) and it reminded me of the virtual cookie swap I am hosting today with my friend Katherine. (Who I got to see this weekend! Yay!) We teamed up with some amazing bloggers to bring you a bunch of different cookie recipes. For my contribution, I am bringing these cute and festive chocolate sugar cookies. 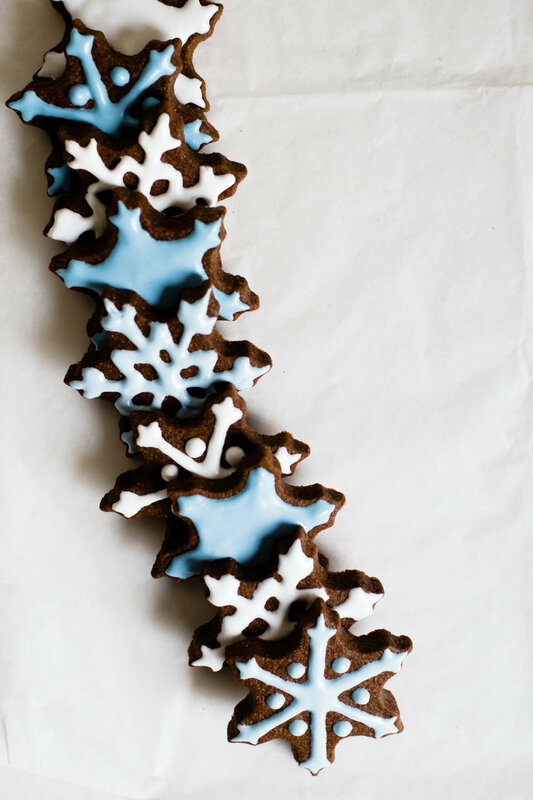 If a brownie and a shortbread had a baby, and covered it in royal icing, it would look and taste like this. Aka delicious AND gorgeous. This was my first time playing with royal icing and while it was actually really fun and kind of therapeutic it also required way more patience than I would normally have. I still think it was worth it for how pretty it turned out but it did take longer than I expected. For the royal icing, I used the recipe on the back of the Wilton meringue powder carton, and just added more water as needed to get the consistency I wanted. If you want to forgo the royal icing you can definitely use buttercream instead. The cookies themselves are not very sweet on their own so keep that in mind - they could use the extra sugar from an icing of some sort! Make sure to check out all the other cookies recipes this year below. 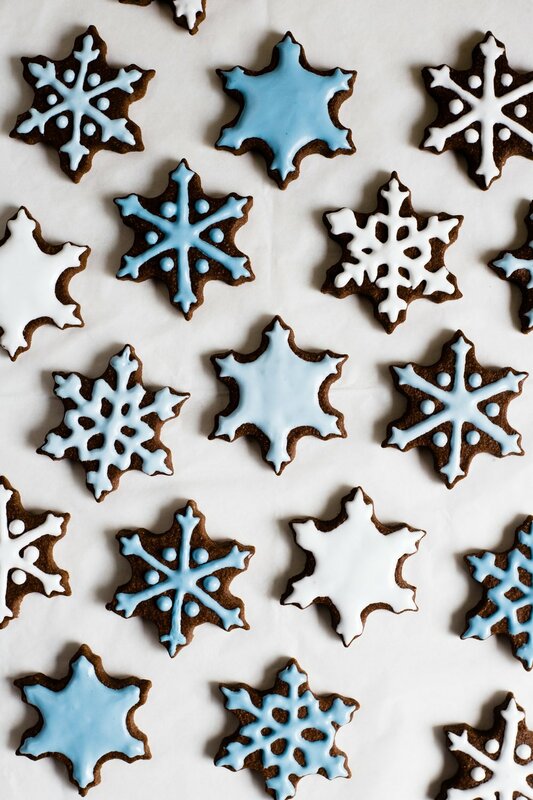 I hope these inspire you during this holiday baking season! In the bowl of a stand mixer fitted with the paddle attachment, cream together the cold butter, oil, sugar, vanilla and salt until smooth. Add in the egg and mix until fully incorporated. With the mixer on low, add in the cornstarch, cocoa powder, and flour. Mix on medium speed until the dough gathers itself into a ball and pulls away from the bowl. Add more flour in 1/4 cup increments if too sticky. Place dough in the refrigerator for 30 min - 1 hour. Roll out the dough until approx 3/8 inch thick. Roll between two sheets of parchment paper to prevent sticking to surface and without adding more flour. Press cookie cutters into the dough to cut out shapes. Re-roll any scraps to make more cookies. Bake in the preheated oven for 9-11 minutes, or until the cookies feel dry on the surface and firm on the edges. Let cool completely. Divide royal icing evenly into three bowls and add drops of blue food coloring to 2 of the bowls until desired color. Transfer to a piping bag or small squeeze bottles and pipe onto cookies. Enjoy!